From a distance, this brightly colored crocheted afghan looks just like a quilt. 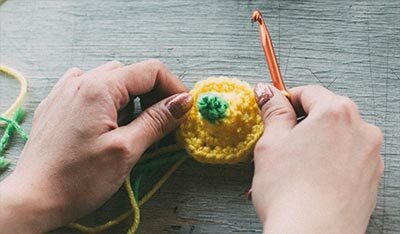 Use deeper yarn colors for a rich, sophisticated look. 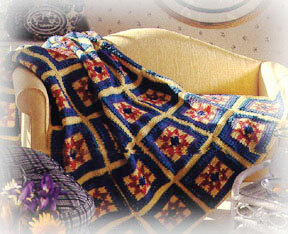 Afghan measures approximately 50" by 70". 3 1/2 stitches and 4 rows = 1"
Check your gauge. Use any size hook to obtain the gauge given! With Color A, chain (ch) 32. Row 1 (Right side): Single crochet (sc) in second ch from hook and in each ch across. 31 sc. Ch 1, turn. 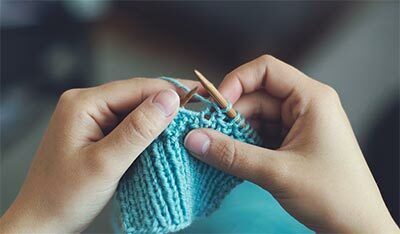 Row 2: Sc in first sc, *treble crochet (tr) in next sc, sc in next sc. Repeat from * across. Ch 1, turn. Row 3: Sc in first stitch and each stitch (st) across. Ch 1, turn. 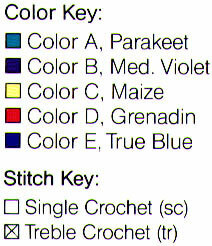 Row 4: Sc in first sc, tr in next sc; insert hook in next st and draw up a loop, drop color in use, with next color (refer to chart) yarn over and draw through both loops on hook--color change made, sc across to within last 4 stitches (sts), work color change in next stitch referring to chart, sc in next sc, tr in next sc, sc in last sc. Ch 1, turn. 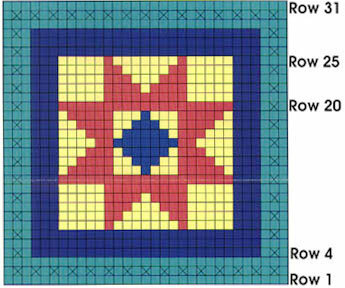 Rows 5-31: Continuing in pattern, follow chart, color and stitch key working color changes as indicated. Wind new color on bobbin for color change (optional). At end of Row 31, do not ch 1. Fasten off. With right side facing, attach Color C to the first st of Row 31, ch 3 counts as one double crochet (dc), dc in same st, * dc across to within last st before corner, 2 dc in last st, ch 1 for corner, 2 dc in end of row on next edge, dc in each row end to within last row before corner, 2 dc in last row end, ch 1*, 2 dc in first st on next edge, repeat from * to *, slip st to top of ch 3 to join. Fasten off. Holding wrong sides of 2 motifs together (right sides facing), whipstitch motifs together through back loops only of border and make 5 rows of 7 squares. With right side facing, attach Color A to back loop only of any dc, ch1, sc in same st, sc evenly spaced around working in back loops only and working 3 sc in each ch-1 corner space, slip st to first sc to join. Fasten off.